Relationships Drift. Marriages End. Hearts Break Open. When my first husband and I went on a boating trip with some friends, we decided to stop in a cove so everyone could jump in the water for a bit. I hopped onto a floating raft. I leaned my head back and closed my eyes behind my sunglasses while I floated on the water and lay in the sun. I’m not certain how long it was, but after a while I heard my name being called from far away and it startled me. I hadn’t been paying attention and had floated pretty far away from the boat. And it was a long swim against the current to get back to the boat. I think that’s sometimes what happens in our marriages. We’re slowly floating further and further away from each other until, over time, the distance is too wide to cross. Sometimes we grow apart and don’t know exactly when the drifting apart began. Maybe it was after he got that promotion – by the time he got home at night, he didn’t have the energy to connect with you like he used to. Maybe it was after you had children and the busyness of your lives and your kids’ needs took precedence. Even when there’s something as heart-jarring as betrayal, lying, or cheating, the drifting between you likely began long before that event ever took place. The wider the gap between two people, the more difficult it is to cross. 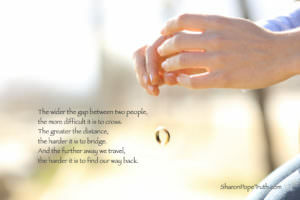 The greater the distance, the harder it is to bridge. And the further away we travel, the harder it is to find our way back. And so relationships drift. Marriages end. Hearts break open.